What is the REPLACE Function? The REPLACE function is categorized under TEXT functionsFunctionsList of the most important Excel functions for financial analysts. This cheat sheet covers 100s of functions that are critical to know as an Excel analyst. The function will replace part of a text string, based on the number of characters you specify, with a different text string. In financial analysis, the REPLACE function can be useful if we wish to remove text from a cell when the text is in a variable position. Old_text (required argument) – It is the text we wish to replace some characters. Start_num (required argument) – It is the position, within old_text, of the first character that you want to replace. Num_chars (required argument) – It is the number of characters to replace. New_text (required argument) – It is the replacement text. 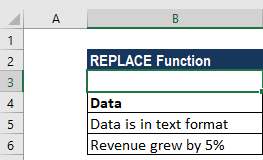 How to use the REPLACE Function in Excel? a. The given start_num argument is negative or is non-numeric value. b. The given num_chars argument is negative or non-numeric. 2. The REPLACE function is designed for use with text strings and returns a text string. Therefore, if we attempt to use the function with a date, time or a number, we may get wired results. We need to select the cell(s) we want to convert to text. 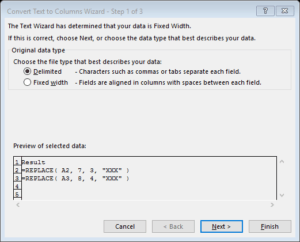 The selected text must not span more than one column. Ensure the Delimited option is selected, then click Next. Ensure all the delimiter options are unselected and then click Next again. Select Text and click the Finish button. The REPLACE function should now work as expected on the values that were converted to text.